The night before last I had a really bad nightmare. 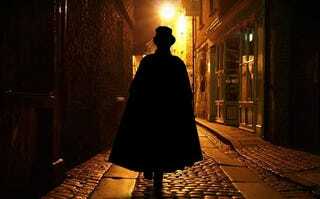 I was being stalked by a Jack the Ripper type kind of guy, black-clad with a knife, and attacked and stabbed. I was screaming "MURDER! MURDER! MURDER!" in my dream, and woke myself up mouthing those words with the missus shaking me. I was happy to wake up, relieved, but embarrassed because I was at least semi-convinced I had been shouting "MURDER! MURDER! MURDER!" at 4 am to my sleeping wife and cats. I rolled over, relieved to be away from that, and went back to sleep and more peaceful dreams. Tonight I asked her, "Um, you know the night before last? When I woke up screaming? Was I making any sense? Was I speaking English words?" Cause I really didn't know if I was actually speaking or if it was all a dream. She said "Yeah, you were yelling about murder. It was kind of disconcerting." So, um, at least I can communicate fairly well from my unconscious? If in a rather quaint, Victorian style? I mean, who yells "MURDER! MURDER!"? Why not "HELP!"? But hey, I guess it got the message across. It was such an effort to speak, in the dream, like walking through molasses, so hard to get even a few syllables out. That's probably why it came out as shouting. Do weird dreams make you talk aloud, GT?